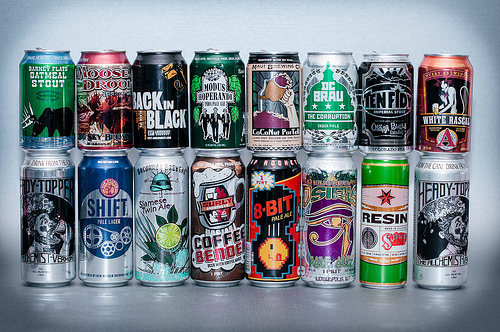 Thanks to this article from the Huffington Post, I can share with you… 15 Awesome Beers in Cans! (Which ones have you tried?) Cans are not a new thing, just a great trend coming back. Dr. B and I have tried Moose Drool, Modus Hoperandi, CoConut Porter, Ten Fidy, White Rascal, Heady Topper (this one is so good it’s photographed twice! ), Shift, and Resin… time to try the rest! Previous Post What’s This? A Beer? I’ve tried the back in black, it’s a black IPA and it’s really good. I’ll keep my eyes out for the others! My favorites of these cans are the Avery and the Tallgrass. Also, Surly is brewed in my hometown, all their beer comes in cans, and they are incredibly popular. Cans are super handy for times when glass isn’t a good idea!